(1) Udaya Shamsher Jang Bahadur Rana. A noted singer and songwriter. He has issue, two sons and one daughter. (a) Maya Luxmi Paulette Rana. Fashion model for Chadwick Models in Melbourne and Sydney. (2) Sunil Shamsher Jung Bahadur Rana. b. at Thapathali Durbar, Katmandu (s/o Rajya Lakshmi), educ. St Xavier’s High Sch, Jawalalkhel. He has issue, one son. (1) Sabina Rajya Lakshmi (d/o Rajya Lakshmi). m. Kishore Jung Thapa. She has issue, two daughters. (2) Manju Rajya Lakshmi (d/o Brig-Gen Pashupati by another lady). m. a son of General Singha Bahadur Basnet, sometime Chief of Army Staff. i) Colonel Suprasidha-Prabala-Gorkha-Dakshina-Bahu Himalaya Shamsher Jung Bahadur Rana. b. at Thapathali, Katmandu, 10th January 1925, educ. Durbar High Sch and Tri-Chandra Coll, Katmandu, St Xavier’s Coll, Sch of Economics & Sociology, Bombay, India, and Harvard Univ, Cambridge, Massachusetts, USA (MA). Sec Finance Ministry 1950-1951, Dir-Gen Nepal Bank Ltd 1951-1956, Gov Nepal Rastra Bank 1956-1962, Programme Officer UNO New York 1962-1964, Dep Resident Repr UNDP Sri Lanka and Afghanistan 1964-1972, Burma 1972-1977, Indonesia 1977-1981, and Pakistan 1981-1986, Mbr National Development Council 1986 and 1992, Chair Himalaya Development Bank Ltd 1992. Rcvd: the Order of the Gurkha Right Hand 1st class, Star of Pakistan, etc. (a) Abhishek Shamsher Jung Bahadur Rana. b. 1988, educ. Gordonstoun Sch, Elgin, Moray, Scotland, and Imperial Coll, London. (a) Cecelia Rajya Lakshmi, educ. Rato Bangala Sch, Lalitpur, and Clark Univ, Worcester, Massachusetts, USA. (1) Pratima Rajya Lakshmi [Mrs Pratima Pandey], educ. United Nations Sch, New York, USA. m. Prithivi Bahadur Pandey, sometime CEO of Indo-Suez Bank in Nepal, Chief Executive Dir Nepal Investment Bank Ltd. She has issue, one son and one daughter. (2) Sangeeta Rajya Lakshmi [Mrs Sangeeta Thapa]. b. 5th May 1961, educ. United World Coll for SE Asia, Singapore; Rosemead Sch, Sussex; West Sussex Coll of Art & Design, and George Mason Univ, Virginia, USA. Artist. Founder Siddhartha Art Gallery in 1986. Presdt Nepal-Netherlands Foundation, Mbr United World Coll Scholarship Panel (Nepal Chapter), Nepal-Sri Lanka Chamber of Commerce, and LALS (Life Savings and Life Giving) AIDS Awareness Charity since 1993, Nepal Heritage Soc, Nepal-Britain Friendship Soc, Exec Mbr International Women’s Assoc of India 1995-1997, UN Woman’s Assoc of Pakistan 1997-1998, Dir Infinity International PR Co. Rcvd: Birendra Aishswarya Padak (2001), and Rajat Mahotsab Padak (1998), Sitara-i-Pakistan, etc. m. ca. 1983, Sunil Bahadur Thapa, educ. St Xavier’s High Sch, Godavari, employed with UNHCR, Head of the UNHCR Field Office in Kosovo, only son of Maha-Ujjwal-Kirtimaya-Nepal-Shripada Om-Ram-Patta Jyotirmaya-Subikhyat-Tri-Shakti-Patta Suprasidha-Prabala-Gorkha-Dakshina-Bahu The Rt. Hon. Surya Bahadur Thapa, five times Prime Minister of Nepal, by his wife, Sushma. She has issue, one son and one daughter. ii) Major Prabakhar Shamsher Jung Bahadur Rana. Milary Attaché at Moscow. He was k. in a car crash, on the Kodari Raj Marg, 1969. (1) Saurabh Shamsher Jung Bahadur Rana. b. 27th June 19xx, educ. Daly Coll, Indore. m. (sep.) Aparna Rajya Lakshmi, nee Kunwari Aparna Devi, daughter of Kunwar Bharat Bhushan Deo, of Kalahandi, by his wife, Kunwarani Shrimathi Asha Poorna Devi, third daughter of Raja Sri Anup Singh Deo, Raja of Khariar Raj, in the Sambalpur district of Orissa. (2) Nikhil Shamsher Jung Bahadur Rana, educ. Daly Coll, Indore, H.R. Coll of Commerce & Economics (B.Com), Churchgate, Mumbai, and Symbiosis Inst of Business Management (SIBM), Lavale, Pune (MBA 2007). Sr Analyst at Citigroup in Mumbai since 2007. m. Asmita Rajya Lakshmi, educ. Sophia Coll, Mumbai (B.Econ. 2005), HR Exec with TATA Trent Ltd in Mumbai since 2007.
v) Prabhat [Pravhat] Shamsher Jung Bahadur Rana. Head of the Nepalese Family Planning Org. m. Rupa Rajya Lakshmi, nee Basnet. i) Bina Rajya Lakshmi. Employed a Radio Nepal. m. ... Rao. She had issue, one son and one daughter. ii) Mina Rajya Lakshmi. m. Jyotirmaya Subikhyat Trishakti Patta Chiran Shamsher Jung Thapa, sometime Deputy Master of Ceremonies and Principle Adviser to King Gynendra. She had issue, two sons and one daughter. a) Hanu Shamsher Jung Bahadur Rana. Presdt Gurkha Military Sch Management Cttee. b) Meena Kumari [Rani Meena Kumari, of Kullu]. m. a Dehra Dun, 5th June 1971, Rai Maheshwar Singh, Rai of Kullu (b. at Bangalore, 12th February 1949), elder son of Rai Mohinder Singh, Rai of Kullu, by his wife, Rani Vina Diveshwari Devi. younger daughter of Commanding-General Supradipta-Manyabara-Nepal-Tara Om-Ram-Patta Jyotirmaya-Subikhyat-Tri-Shakti-Patta Suprasidha-Prabala-Gorkha-Dakshina-Bahu Sri Sri Sri Maharajkumar Sir Krishna Shamsher Jung Bahadur Rana, KCSI, KBE. She had issue, two sons – see India Zamindars (Kullu). (1) Avlokan Shumsher Jung Bahadur Rana.b. 5th August 1989, educ. St George’s Coll, Mussoorie, and Stratford Univ, New Delhi, India. 5) Sri Sri Sri Maharajkumar Najaya Shamsher Jang Bahadur Rana. b. at the Fair Lawn Palace, Jharipani, Mussoorie, India, 19xx (s/o Krishna Kumari). He d.v.p. young. 6) Sri Sri Sri Maharajkumar Jagut Shamsher Jang Bahadur Rana. b. at the Fair Lawn Palace, Jharipani, Mussoorie, India, 19xx (s/o Krishna Kumari), educ. Mayo Coll, Ajmer. Proprietor of “Sun Saan”, Western Doon, India. (1) Shivangini Rajya Lakshmi, educ. Mayo Coll Girls’Sch, Ajmer, India, and Swiss Hotel Management Sch, Les Roches, Switzerland. a) A daughter. m. at Lucknow, 1938, as his first wife, Rajkumar Sri Hardyal Singh (b. at Jaipur, 9th July 1922; d.s.p.m. 15th June 1954), eldest surviving son of Sri Rao Raja Kalyan Singh Bahadur, of Sikar, under Jaipur, India – see India (Jaipur-Sikar). (1) Deep Shumshere Jung Bahadur Rana. Inspector Royal Nepal Police. He had issue, one son and one daughter. (1) Siddarth Shumshere Jung Bahadur Rana. 10) Lieutenant-Colonel Kanwar Prakash Shamsher Jung Bahadur Rana (c), educ. Mayo Coll, Ajmer. Co-operative Mbr Court of Appeal. 12) Kanwar Lokendra Shamsher Jung Bahadur Rana (c). 13) Kanwar Krishna Shamsher Jung Bahadur Rana (c). 1) Sri Sri Sri Maharajkumari Mandalasa Rajya Lakshmi Devi [H.H. Maharani Mandalasa Kumari Deviji Sahiba, of Sirmur]. b. at Katmandu, 1896 (d/o Krishna Kumari), educ. privately. Dir Jagatsons International Corp. m. at the Sirmur Camp, Dehra Dun, 4th March 1910, Lieutenant-Colonel H.H. Maharaja Sir Amar Prakash Bahadur, Maharaja of Sirmur, KCSI, KCIE (b. at Nahan, 26th January 1888; d. at the Wiennier Cottage Sanatorium, Vienna, Austria, 13th August 1933), eldest son of H.H. Shri Raja Sir Surendra Bikram Prakash Bahadur, Raja of Sirmur, KCSI, by his wife, H.H. Shri Suketwala Rani Subhadra Deviji Sahiba, daughter of H.H. Raja Shri Rudra Sen Bahadur, Raja of Suket. She d. at Nahun, February 1973, having had issue one son and two daughters – see India (Sirmur). 2) Sri Sri Sri Maharajkumari Shri ... Rajya Lakshmi Devi (third d/o Krishna Kumari). m. June 1912, Shriman Maharajkumar Shri Man Singhji Bahadur, Yuvaraj Sahib of Partabgarh (b. at the Deogarh Palace, Partabgarh, 13th April 1886; d.v.p. at Partabgarh, 29th October 1918), eldest son of H.H. Maharajadhiraj Maharawat Shri Sir Raghunath Singhji Bahadur, Maharawat of Partabgarh, KCIE, by his wife, H.H. Bada Pisangan Maharani Bapu Sahiba Shri Ugam Kanwarji Sahiba, elder daughter of Raja Shri Pratap Singh, Thakur of Pisangan, in Ajmer Merwara. She d.s.p. young - see India (Partabgarh). 3) Sri Sri Sri Maharajkumari Shri Bhuvaneshwari Rajya Lakshmi Devi [Srimathi Rani Bhuvaneshwari Rajya Lakshmi Devi Sahiba, of Khairigarh Raj], KIH Silver Medal (12.6.1941). b. at Dhankota, October 1901 (d/o Krishna Kumari). m. 1914, Raja Pratap Bikram Shah, Raja of Khairigarh-Singahi (b. at Singahi, Lakhimpur-Kheri, UP, 24th October 1894; d. at Lucknow, 1964), adopted son of Srimathi Maharani Surat Kunwar, OBE, of Khairigarh-Singahi, in the Kheri district of UP, India. She had issue, two sons and one daughter – see India Zamindars (Khairigarh). 4) Kunveri Gupta Devi (c). 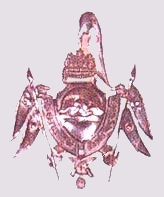 m. (morganatic) Lieutenant-Colonel H.H. Shri Maharaja Sir Amar Prakash Bahadur, Maharaja of Sirmur, KCSI, KCIE (b. at Nahan, 26th January 1888; d. at Vienna, Austria, 13th August 1933), eldest son of H.H. Shri Raja Sir Surendra Bikram Prakash Bahadur, Raja of Sirmur, KCSI, by his wife, H.H. Shri Suketwala Rani Subhadra Deviji Sahiba, daughter of H.H. Raja Shri Rudra Sen Bahadur, Raja of Suket. She d. 1920, having had issue, one son and two daughters - see India (Sirmur). 5) Kunveri Indra Kumari Devi [Rani Narpat Singh] (c). m. 1916, Colonel Rao Bahadur Rao Raja Narpat Singh (b. at Jodhpur, 28th March 1892; d. 23rd June 1967), eldest son of Lieutenant-General H.H. 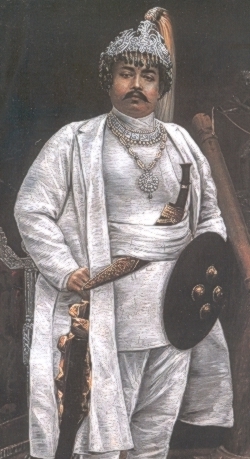 Maharajadhiraja Maharaja Shri Sir Pratap Singhji Sahib Bahadur, Maharaja of Idar, GCB, GCSI, GCVO, KIH. She had issue, two sons and one daughter – see India (Idar).